When more than 10,000 ardent Second Amendment defenders gathered at the Time Warner Cable Arena in Charlotte, N.C., for the Celebration of American Values Freedom Experience during the 2010 NRA Annual Meetings, they did so just five days shy of the 235th anniversary of an event with both local and national significance--a historical coincidence not lost on one of the evening`s headline speakers. Prior to serving 20 years in the U.S. House of Representatives, culminating with his stint as Speaker of the House from 1995 to 1999, Newt Gingrich was a college history professor. It should come as no surprise, then, that when delivering his frank discussion on individual liberty, campaign finance reform and Second Amendment rights at the Annual Meetings gala event, he couched his monologue in historical terms. "I believe it is time we had a total, clear, unequivocal argument about who we are as a people, and what our government is, and what the basis of it is," Gingrich told the audience. "I want to preface my explanation of the Second Amendment by saying it is not in defense of hunting. It is not in defense of target shooting. It is not in defense of collecting. The Second Amendment is in defense of freedom from the state." With that, Gingrich once again assumed the role of history professor, albeit one with a lesson not likely to be taught by the academic elites. 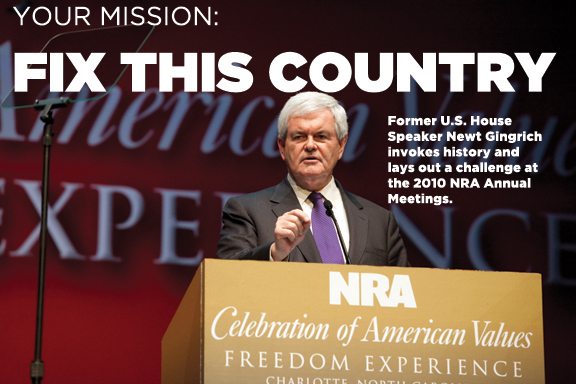 Gingrich described to the cheering NRA members the role Charlotte and the surrounding Mecklenburg County area played in the establishment of freedoms we hold dear as Americans. Two hundred thirty-four years and 361 days prior to the Celebration of American Values Freedom Experience, local citizens signed the Mecklenburg Declaration of Independence. Regarded by some historians as the first declaration of its kind made in the 13 colonies, the Mecklenburg Declaration of Inde-pendence was signed on May 20, 1774--more than a year prior to the signing of the U.S. Declaration of Independence. Gingrich recounted the events leading to this historic declaration. "The colonies had for five years been in a tremendous struggle with the imperial government from the imperial capital," Gingrich said. "The imperial government had ruthless and arrogant judges who continued to infuriate Americans. The imperial government believed it could tax people even if they didn`t want to be taxed. They believed they could pass regulations even if the people hated the regulations. They believed they could impose their will upon the people, and that the center of power was the king, not the people. And so the Americans, increasingly unhappy over this five-year period, had their tension grow." The parallel between British Colonial rule in early America and the modern political landscape was lost on no one in attendance as Gingrich continued his lesson on the birth of American liberty. "The imperial government, however, was used to crushing rebellions. It had crushed a rebellion in Scotland, it had crushed a rebellion in Ireland, and it had crushed a rebellion in rural England. So it decided that they would once again teach a lesson to those people who thought they could be independent of the government--people who believed they could stand in their own rights as citizens." Gingrich recounted how the British, seeking to quell the increasingly rebellious sentiment among the colonists, dispatched soldiers to rural Massachusetts in April 1775. When the soldiers arrived, they were shocked by what awaited them. "They didn`t encounter rabble, they didn`t encounter unarmed peasants and they didn`t encounter people who are frightened," Gingrich said. "They encountered trained militia who had organized themselves over the entire previous year, gathered up weapons and ammunition, and were prepared to fight the British army toe to toe, and in fact drove them back into Boston with substantial losses. "That was called the shot that was heard around the world and it was heard here, in Mecklenburg County," Gingrich told the cheering crowd. The people of Mecklenburg County, N.C., soon decided to send a message to London with the Mecklenburg County Declaration of Independence. A year and six weeks later, the rest of the colonies followed suit with the signing of the United States Declaration of Independence in Philadelphia. "The heart of the American experience that no modern liberal academic wants to teach, and no modern, liberal news media wants to cover is a political document," Gingrich said. "This political document is our Declaration of Independence. It says we are endowed by our Creator with certain inalienable rights. We are the only nation in the world that says power comes from God to each one of you, and you are personally sovereign, and you loan power to the state. "The state is not the center of the power," Gingrich said, as the crowd sat on the verge of another thunderous round of applause. "The citizen is the center of power." Gingrich went on to explain why "secular socialists," as he terms them, despise and seek to undermine the First and Second Amendments to the Constitution. "The First Amendment has two provisions that drive them crazy: The first says that Congress shall make no law abridging freedom of speech. Of course, from McCain-Feingold to all the various campaign laws, to the most recent effort by Chuck Schumer, these are all just efforts at protecting incumbents. "The Founding Fathers had a simple model," Gingrich said. "Citizens ought to have the freedom to say what they want to say, when they want to say it, and if it makes politicians uncomfortable, let them quit elected office. "The second thing that the left hates about the First Amendment," Gingrich continued, "is its statement ‘Congress shall make no law respecting the establishment of religion.` Remember, when the Founding Fathers wrote the First Amendment, they said our rights come from our Creator. "That limitation to government inherent in the model of God-given rights makes it very hard to be a true socialist. It means that instead of the state being in charge, and instead of politicians, to take a recent case, deciding how much you should be able to earn based on whether or not the politician likes your particular company or your industry or your personality, in fact, it is none of the politician`s business because you have the God-given right to pursue happiness with no exception for when Obama is unhappy." From there, Gingrich explained the wisdom of the Founding Fathers in making a provision for the citizenry to protect not only its First Amendment freedoms, but all other freedoms enumerated within the Constitution and Bill of Rights. "The Founding Fathers were very wise and experienced people," he said. "They understood the danger of tyranny. So they said to themselves, ‘Well, if we are going to tell you in writing that you have the right to free speech, and we are going to tell you in writing that you have the right to religion, how are we going to give you, the people, power to enforce that?` They said you, as a citizen, have the Right to Bear Arms. And the government has no business trying to stop you, as a legal and law-abiding citizen, from being able to protect yourself."